A niche supplier of electrical products, primarily customized and standard power cords and electrical cable and wire products, was seeking to refinance its existing debt and support working capital. The Company was saddled with debt from a former sister company that went out of business in 2010. This debt obligation, while being reduced over time, limited the Company’s ability to invest in its busienss and created working capital constraints. The Company worked diligently to cut costs and improve margins and needed a new lender that understood the business and could provide working capital financing to support its growth. The Company retained Concord as its exclusive financial advisor to arrange its debt financing and identify a lender that understood the Company’s business and objectives. 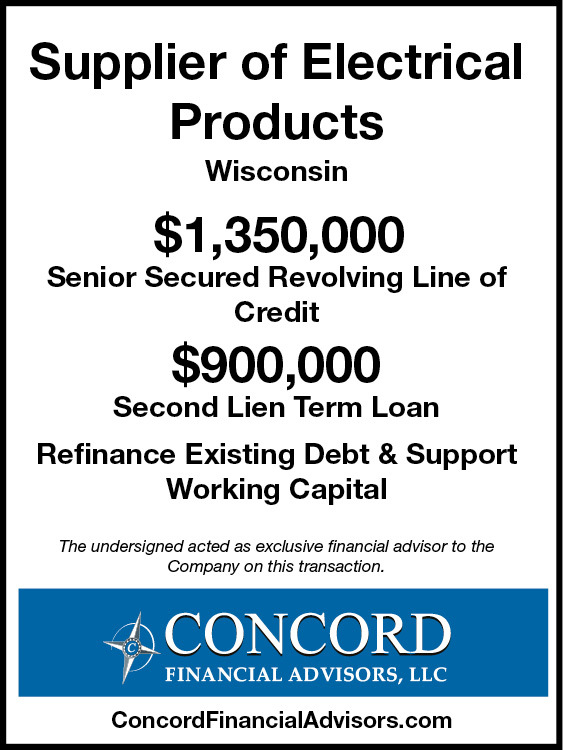 Concord quickly identified the most appropriate senior lenders for the Company and prepared a detailed memorandum highlighting the Company’s diverse, blue chip customer base, strong supplier network, efficient operations, and strong management team. Concord conducted a targeted and efficient deal process with regional and national asset-based lenders to procure the most appropriate financing for the Company. A family office provided a $1.35 million senior secured working capital line of credit and the existing lender, a national bank, took back a $900K junior secured term loan. The Company’s owner and management team were impressed with Concord’s proven process and its ability to negotiate and structure a multi-faceted financing solution.